Sunseeker London has confirmed that it will be bringing three models to this year’s London On-Water Boat Show – the Manhattan 55 (pictured above), Predator 57 and 68 Sport Yacht. While Sunseeker London did represent the brand at last year’s London Yacht Jet & Prestige Car Show in Old Billingsgate, this announcement marks the first Sunseeker models that will be on display at the St Katharine Docks part of the show. All three models will be available for viewing from May 4-7 at the Central London marina, but the Sunseeker Predator 57 is likely to draw the biggest crowds. The fastest selling Sunseeker to date with 66 models built in 12 months, this 57ft convertible sportscruiser was also one of the winners at the 2016 Motor Boat Awards. 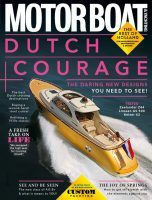 Other confirmed models include the Fairline Targa 38, Princess 72MY and our March edition cover star, the XO 360.